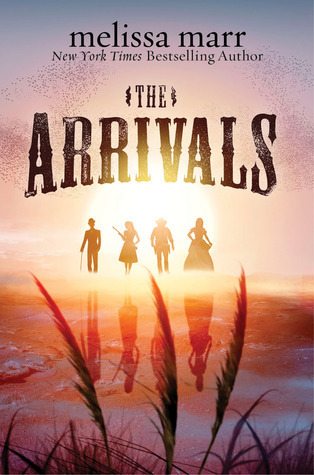 The Arrivals are people from modern times (the late 1800s to present) who mysteriously wake in an alternate world called the Wasteland, a weird west populated by werewolves, dragons, vampires, and other odd creatures. They have little in common except that they each killed someone in their former life, and have no memory of how they arrived. For reasons that are not clear, they are subject to recruitment from the major power factions in the Wasteland, possibly because they are quasi-deathless. When an Arrival is killed, there’s a chance he or she will wake up a few days later. Again, no one knows why or can predict it. It’s an interesting setup, and the cover blurbs promise a great deal. Unfortunately, the book does not deliver. There are two major problems with the book: the book itself, and how it has been marketed. I think the major sin here is marketing. The cover blurb promises a complex and richly drawn dark fantasy adventure that is “equal parts the Matrix and The Wizard of Oz.” The book instead delivers a paranormal romance in a weird west setting. If there is a relationship to either of the films mentioned it lies only in the “stranger dropped into another world” setup, which is not much to hang your Stetson on, and begs for unfavorable comparisons. Likewise, the cover suggests that Chloe will be the central focus of the work, but the brother-sister tandem of Kitty and Jack are more central to the narrative. It seems unfair to the author for the publisher to set up the wrong expectations with the cover design like this. It would have to be a very good book to recover after that kind of bait-and-switch. This leads to the second problem. The book itself is poor. The writing is not strong, with an inconsistent voice and poor pacing. It bogs in places and feels rushed in others. The prose is at times clunky and awkward. The world-building doesn’t suggest a coherent place, but seems to take more of a kitchen-sink approach. The author’s prior offerings have primarily been Young Adult and romance, and it shows. There is an excessive and repetitive focus on explaining what characters are thinking and feeling, and describing their relationships at the expense of plot and action. The writing has a very strong romance novel flavor and although marketed as an adult novel, the reading level is very YA. The characters lack depth and complexity, right down to a comic-book villain that explains himself in the anticlimactic confrontation. I have not read any of Marr’s other books, but she’s cranking out more than one novel per year in addition to graphic novels and short fiction, which raises the question of quality control. Fans of YA para-romance might enjoy this, but fans of horror or the weird west will want to pass.